The Middle East has always been among the top places overseas Filipino workers (OFWs) go to for employment through the years. Kuwait, along with the UAE and Saudi Arabia, comprise the countries with the most number of OFWs, mostly domestic helpers, in the Middle East to date. However, as political and economic factors come into play in recent years, the numbers seem to shift slightly, indicating a downward trend for this population. In a recent statistical report released the central statistics department, the number of Filipinas in Kuwait has dropped by at least 14%, as shared in a report by the Kuwait Times. The number of Filipina workers has seen a drop from 161,500 at the end of 2017, to 138,500 by the end of last year, in nine months. According to legal experts, the reason for this downward trend may have been the crisis over domestic helpers, which broke out last year. Furthermore, the total number of Filipinos comprising both genders also dropped during the same period from 234,000 to 216,200, or 12% of those who have left the country in nine months from last year. Out of this number, 86% are females. In Kuwait, Filipinos (216,000) form the fourth largest nationality among foreign workers after Indians (889,000), Egyptians (484,000), and Bangladeshis (271,000), to date. 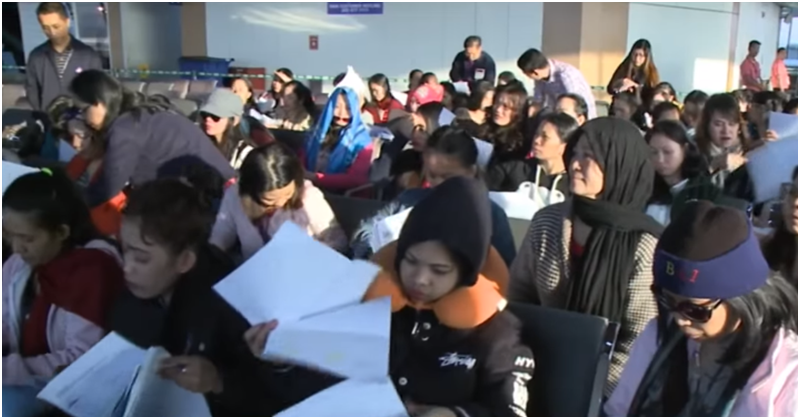 Statistics also showed that the total number of domestic helpers at the end of the third quarter of 2018 was 689,000, noting an increase by 9,000 compared to the same period in 2017. Four nationalities, which include Indian, Filipino, Bangladeshi, and Sri Lankan, make up 89% of the total domestic help and private sector workers in the country.